A little country charmer at one point, I’m sure. I used spray paint for this one. I wasn’t looking forward to painting all the spindly parts and this really had no finish on it. 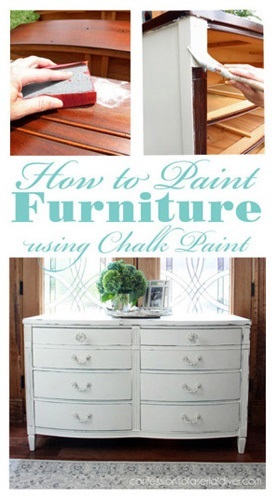 I spray primed first, followed by two coats of Rustoleum’s Blossom White in Satin. Then I gave it a little sanding here and there. I was originally going to make a chair cushion with a pleated skirt, but I would have had to work around the arms for that, so I decided to add some padding to the seat instead. This was a piece of scrap linen I had leftover from another project. I used Lesley Riley’s TAP (Transfer Artist Paper) (affiliate link) to transfer these graphics to it. 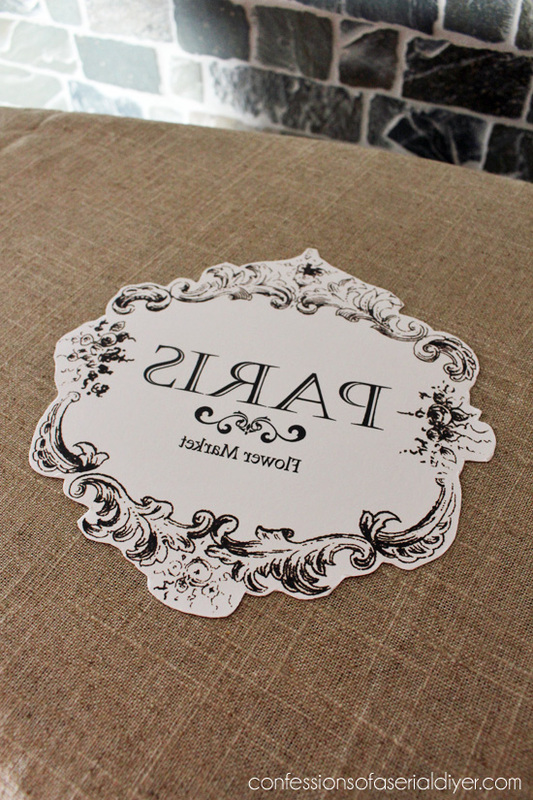 Just print in the reverse, cut around the edges, and iron to transfer the image. You can see more here where I used this graphic before. I found it online, but it was not linked to anyone. It may have originally come from The Graphics Fairy. Adding the padded seat was simple. 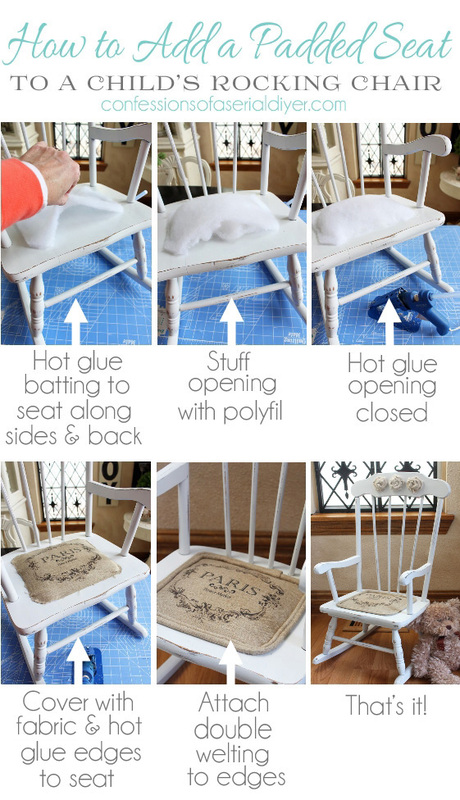 I’m not sure how this method would do for an adult-sized piece, but it is perfect for little chairs intended for little behinds! I used hot glue to add the welting. I think this little chair is so sweet now. This would go perfectly in a room with that mirror! 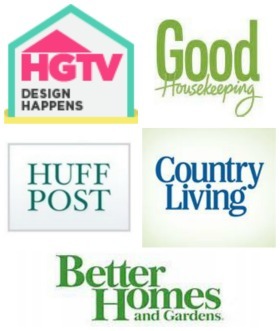 There’s so much more inspiration from my talented friends below! 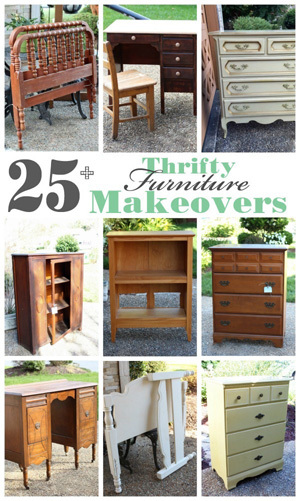 Looking to update a chair anytime soon? This is so adorable….I LOVE the seat padding and rosettes. They are the perfect finishing touches! I love when I get a notification that you added some thing because I know it’s going to be amazing whatever it is. You have been creatively blessed:) thanks for sharing! The chair is adorable and the rosettes and seat cover are very fitting. 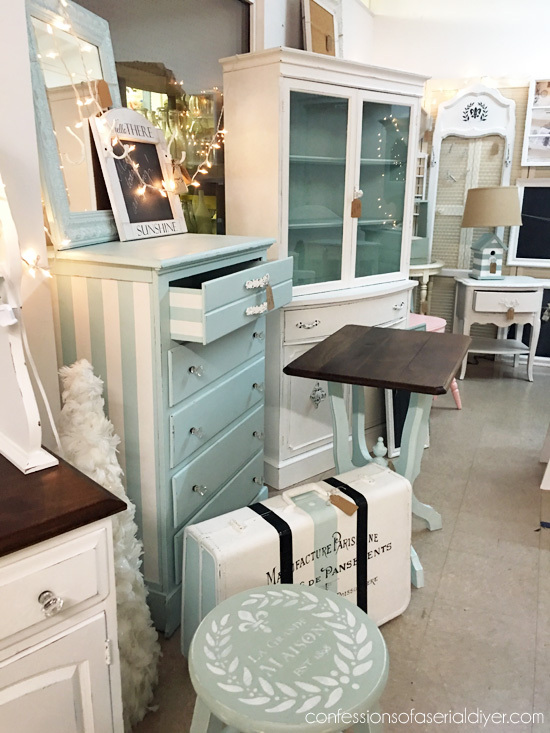 I did a chair exactly like that this past summer for a client. I recognize the fruit pattern inlay on the back. 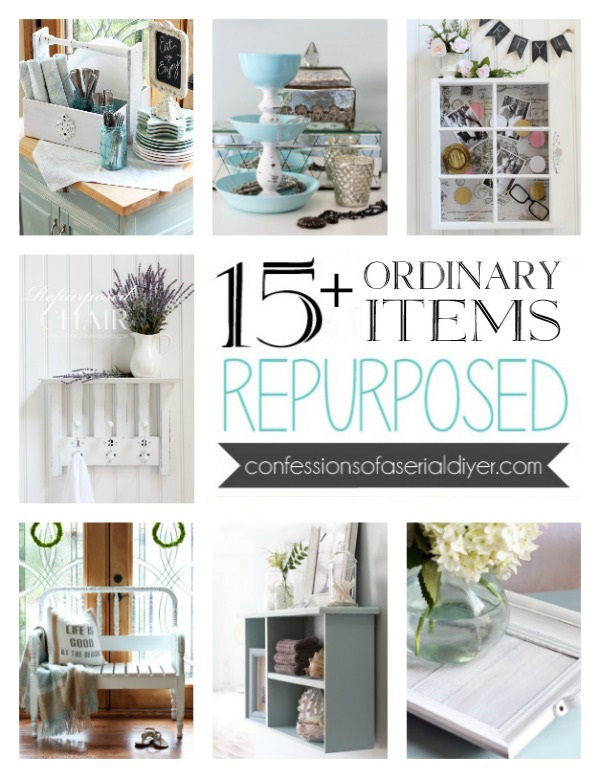 Can’t wait to see your 31 days projects! Oh, did I ever tell you what a hard worker you are!?! Christy, this is adorable! I love the rosettes and the details. I laughed when I read your reason for using spray paint. Oh yeah! This would be great as a full-size rocker as well. Yay Christy!!! 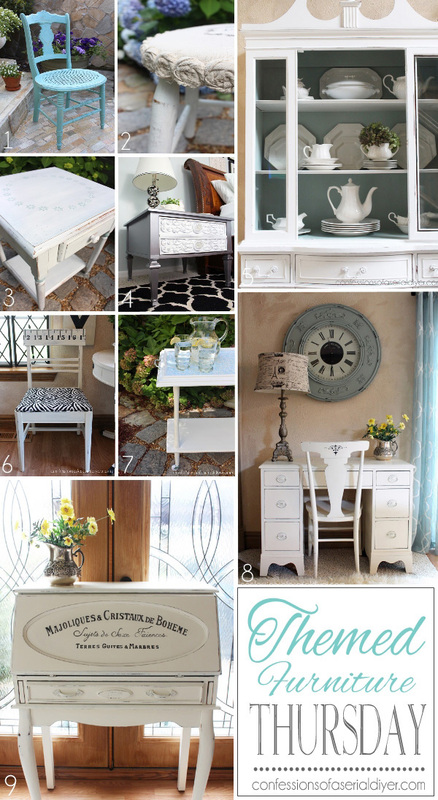 What a beautiful job and tutorial….I pinned it to my inspirations board! What a great idea! I’ve seen so many kid’s rockers, but never one as lovely as this! Christy, you cute little rocker ROCKS! I love, love, love the little rosettes. 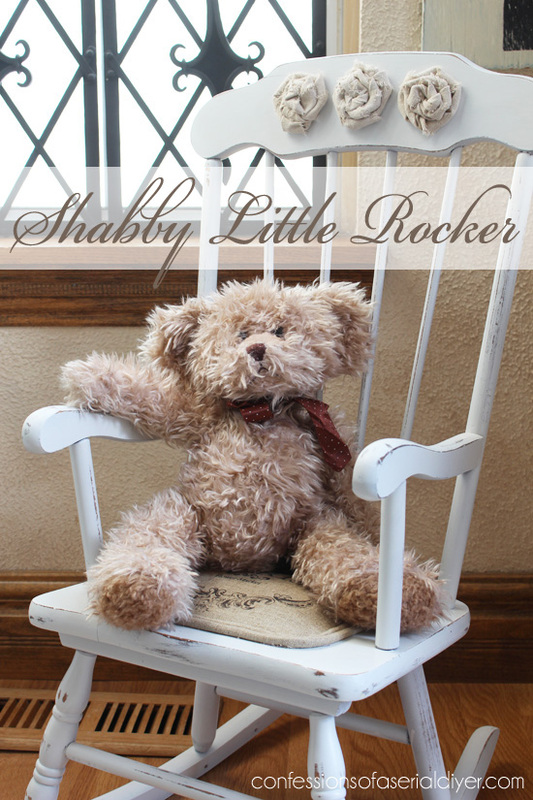 This rocker is now perfect for a little girl’s room. I love the padded seat you added with the transfer and the sweet rosettes you added to the top. Perfection! 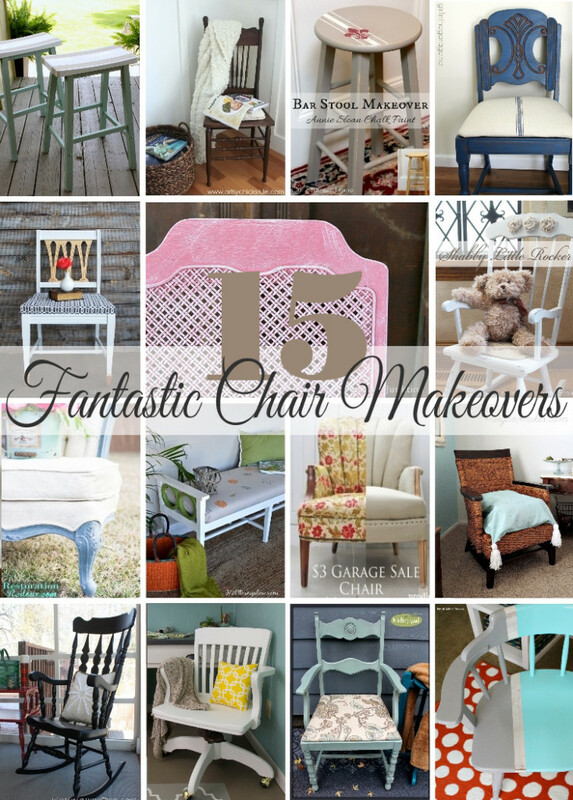 That is one sweet rocking chair makeover! 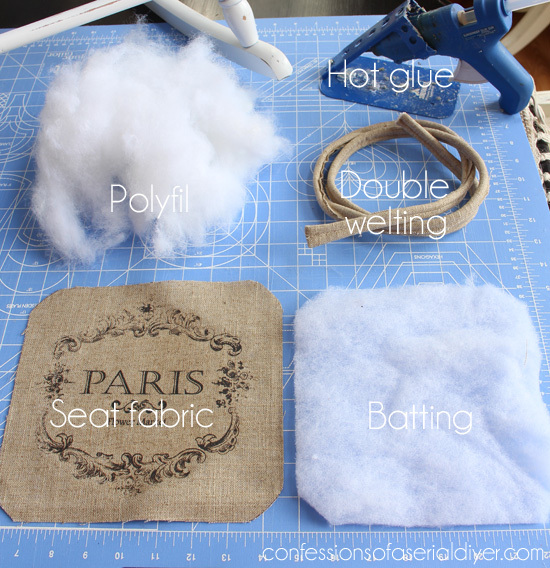 Love the chair pad and appreciate the tutorial (which I have pinned). Christy where do you buy the Lesley Riley’s TAP paper? 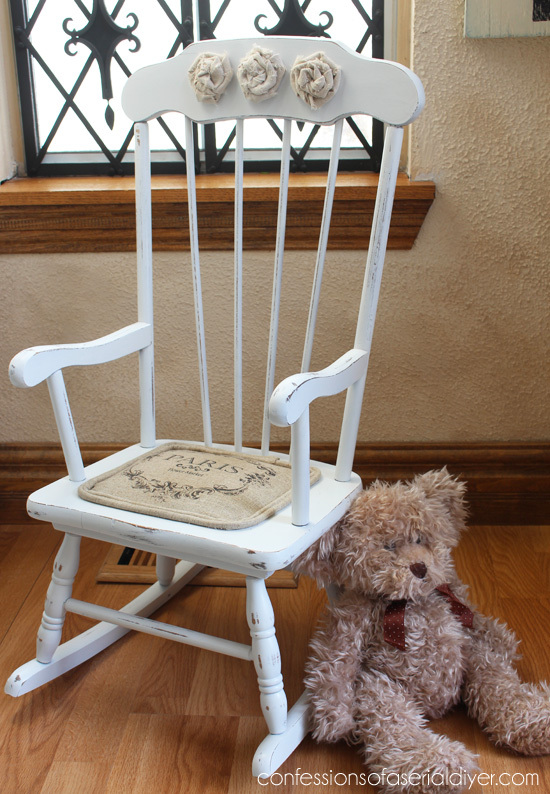 I just refinished the adult version of that exact chair last week for my daughter who is due with her first baby in early April. Now I’m thinking I need to cushion it with a sweet pad! Thanks, Marie! I buy online from Amazon. 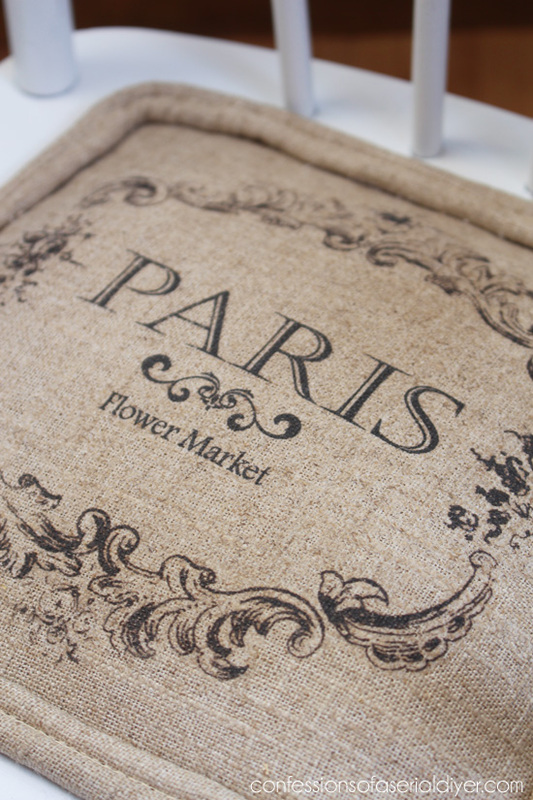 It’s a bit pricey, but it is awesome on fabric! It turned out beautiful! 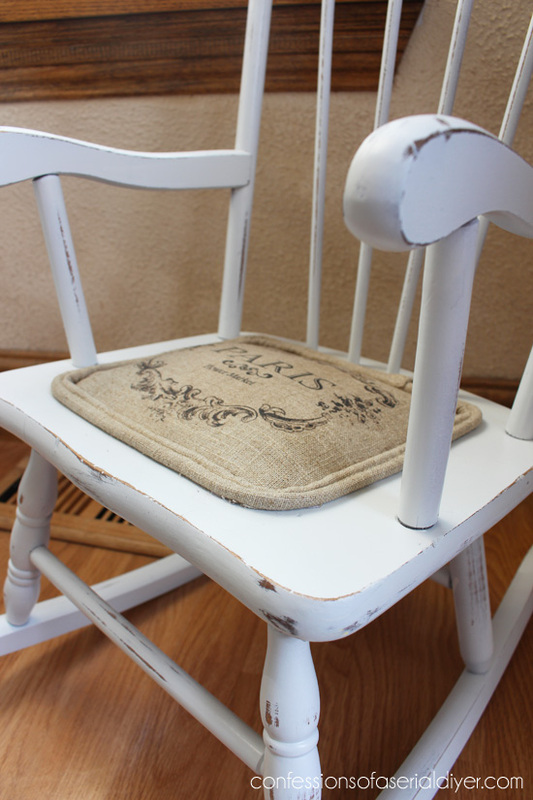 I love the shabby look, and your seat cushion looks great. And love how you added the Rosetts. Nice job! Christy, I just looked at your sectional makeover, yikes! I don’t know if I would try something like that. Especially if it was brand new to begin with. I could just hear my husband now. “You want to what?” It did turn out beautiful! Kudos to you on a job well done! This is too darn cute! 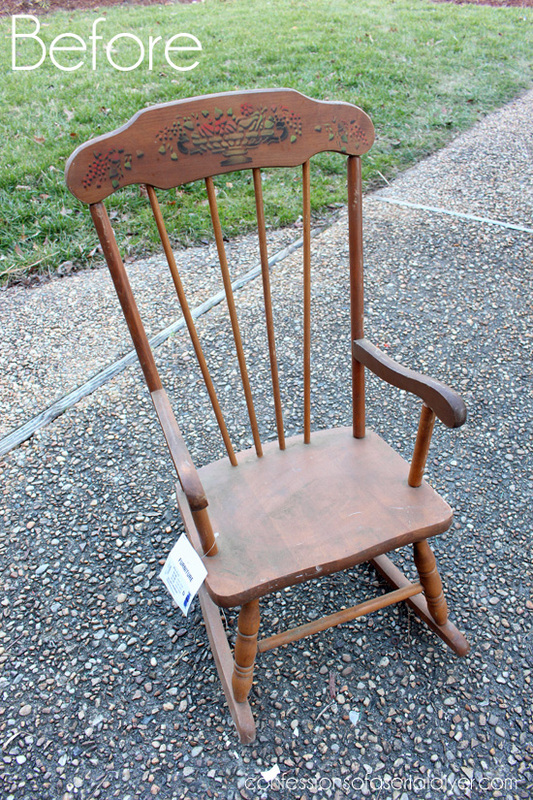 I am actually on the look out for a rocking chair. I use to nurse my little guy in one all the time and read stories. He stopped sitting in it for a while and I gave it away a few years ago. Since December, he has been wanting one. 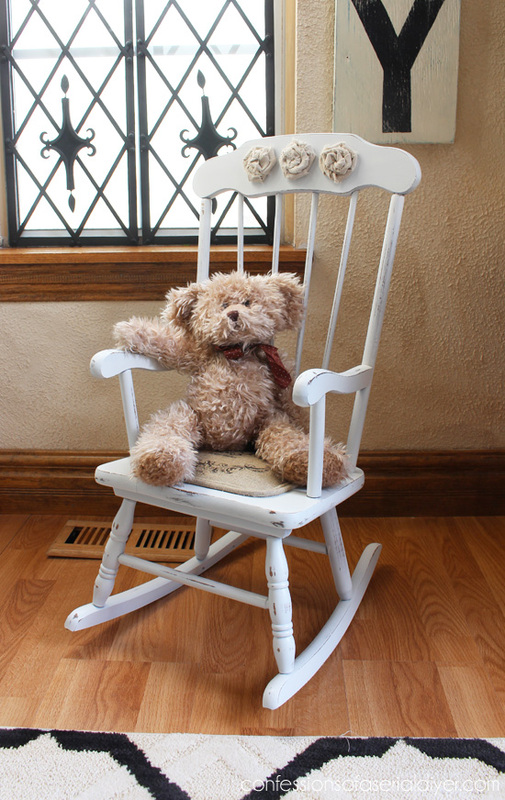 He is very kinesthetic, so a rocking chair is perfect for him. I am trying to find one that will go with his room decor, but not pay a lot of money. Say, can you recommend a vinyl patch kit? 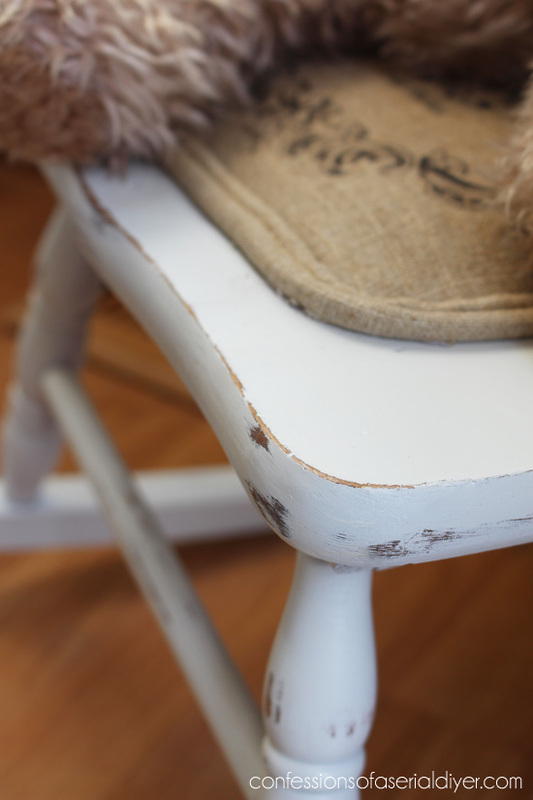 I have two chairs I picked up at a Restore and they need some very minor vinyl repair. 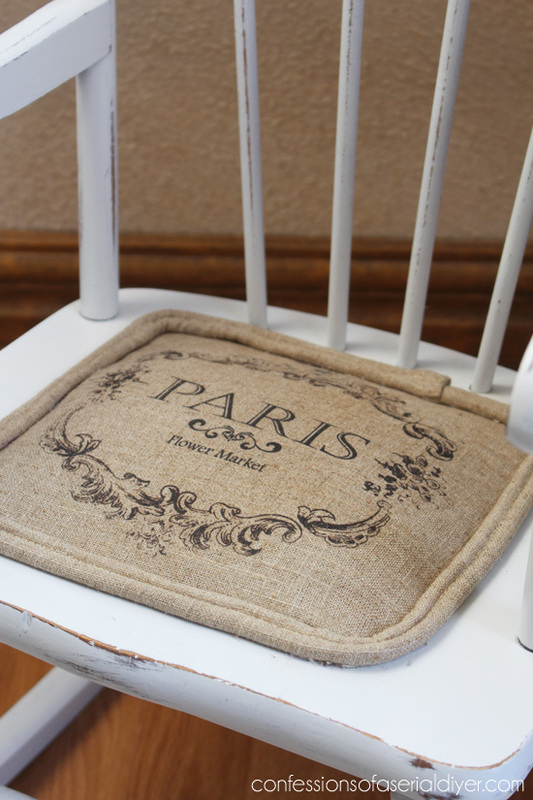 Love the Paris seat you added too. Is there anything you can’t do! This is beautiful! 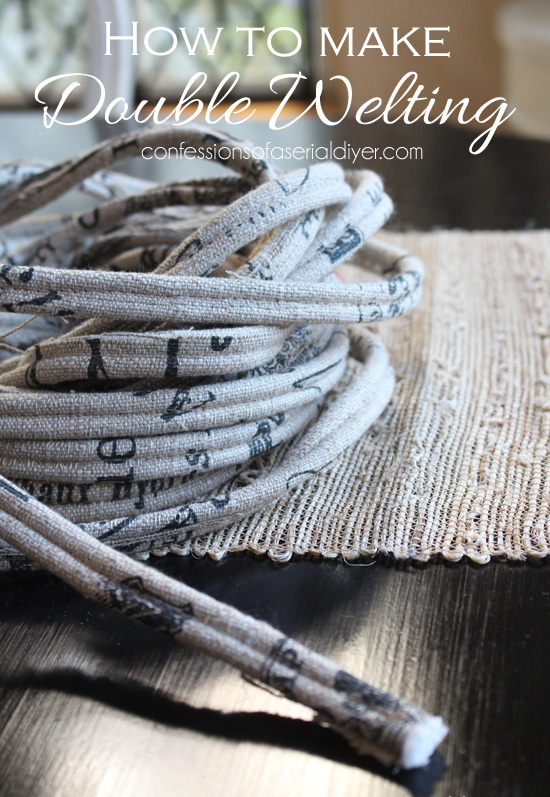 What a cute makeover and I love the tap transfer paper too! So cute! I love the rosettes on the back! Nice transformation. This was so creative! Loving the added seat bottom, that was such a creative detail! 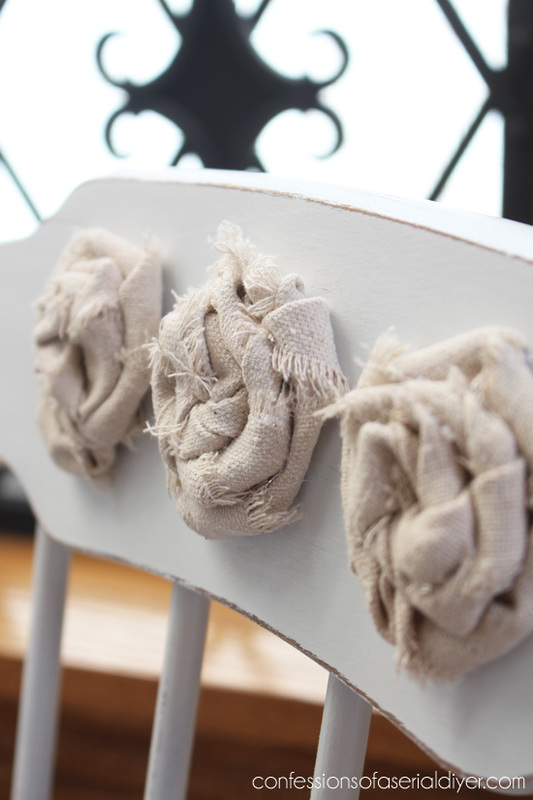 You have me thinking of a project I want to do with those cute little rosette flowers. I’ve made them once and will probably burn the daytlights out of my fingers when I make them again:) Love them on your sweet little chair! This chair is just precious. I’ve got to make some of those rosettes!!! LOVE!! Thanks, Christy! The rosettes are so easy…I have to hold back from wanting to put them on everything lol! This is adorable, Christy! I am a little jealous that you can spray paint in February though… 😉 I would never have known how to make a seat pad like that – thanks for sharing your tutorial! This turned out so pretty! The seat and the rosettes make it, for sure. You are one talented lady!